Architect Ely Jacques Kahn mentored Ayn Rand when she was writing The Fountainhead. Successful and well-connected, he was a social model for Guy Francon — but there was a touch of Roark in him, as well. So reads Ayn Rand’s dedication in The Fountainhead. Altruism is not a virtue in the Objectivist scheme of things, certainly not if it involves self-sacrifice. But generosity and benevolence are a different matter. And so it was that novelist Rand gladly accepted the generosity of architect Ely Jacques Kahn. I am — as a professor at NYU’s School of Continuing and Professional Studies who has the great pleasure of teaching the course “The Fountainhead in New York City” — not among the “majority of men” to whom Ely Jacques Kahn is “unknown, undiscovered.” But literally millions of New Yorkers pass by his dozens of buildings every single day with no inkling of who he was, let alone his role in helping Ayn Rand write her breakout novel. Rand was enthralled by the works of Frank Lloyd Wright when she was preparing The Fountainhead. (If this wasn’t already obvious enough back then, we see it over and over in her posthumously published notebooks and correspondence.) But there were problems with Wright. The mid-westerner had a distinctly anti-urban and, especially anti-New York bias. And, protégé though he was of Louis Sullivan (the “Father of the Skyscraper,” and real-life counterpart of Henry Cameron), Wright was never keen on reaching for the heavens. Worse still, Frank Lloyd Wright was stand-offish towards the then-unknown novelist Ayn Rand. Ely Jacques Kahn (1884-1972) was different. When apprised of Rand’s project, he welcomed her to his office as unsalaried assistant for a half year in 1937 and served as her mentor on the architectural profession. Kahn and Francon did indeed have elements in common. The real-life and the fictional architects were both trained at the Beaux-Arts School in Paris. Neither had the genius nor daring of a Wright or a Roark. Both were professionally and financially quite successful. 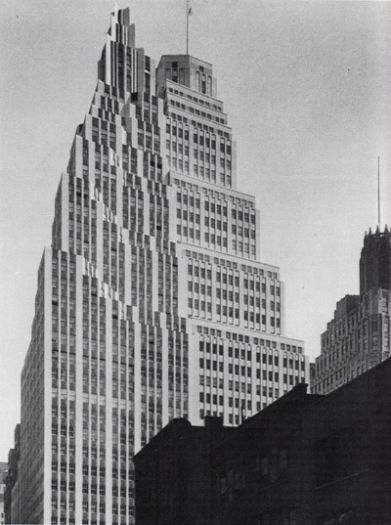 By the early 1930s, Kahn and his partners had already built two dozen skyscrapers in New York, some soaring to over 40 stories. At his height in the late Twenties — this was before the Great Depression, which affected all architects, real and fictional — Kahn’s office employed a staff of over 120. But much, if not all, of the similarity between Ely Jacques Kahn and Guy Francon ends there. Already when The Fountainhead opens in 1922, Guy Francon, at age 51, “ha[d]n’t designed a dog house in eight years.” He was now a debonair socializer, attracting clients to his firm, and on his way to a comfortable retirement. Kahn, by contrast was very much a hands-on architect. 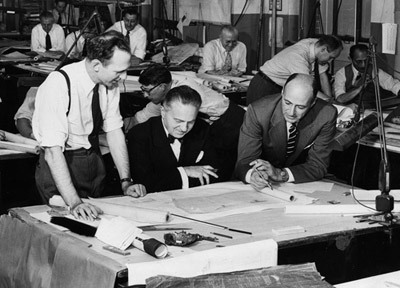 True, he was quite willing to delegate various design aspects of his buildings to his talented protégés — many from abroad, including refugees from Nazi Germany — and he socialized as necessary with the garment industry real estate developers who were his potential clients. But Kahn was actively involved in creating all the buildings of his firm, and would be especially prolific again in the postwar boom, up to his retirement at age 81. More importantly, Kahn was an architect of integrity and an innovator in skyscraper design. Two Kahn buildings on Broadway between West 38th and West 37th Streets (both completed 1931). Note the vertical dynamism of the first building, including fins on the top levels. Kahn had other ideas about skyscraper ornamentation. There was, however, one European “novelty” which did inspire Kahn: art deco. Already in his early work Kahn showed his preference for the geometric patterns of Persian and Moorish motifs. At the Exposition Internationale des Arts Décoratifs et Industriels Modernes in Paris in 1925, Kahn was impressed by the “curious lighthearted daring” of the “bolder spirits” of the new trend. 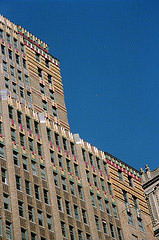 Abstract geometric art-deco forms would henceforth be a Kahn hallmark in the ornamentation of the exteriors and lobbies of his skyscrapers: multi-colored cubist or jazzy zigzag motifs of terra-cotta or contrasting brick hues, often in bold three-dimensional relief. But what of the skyscraper’s overall form, not just its ornamentation? Most early Twentieth Century New York high-rises were characterized by their massive box shapes. The simple fact was that real-estate developers wanted maximum rentable floor space. Form followed function ... and function followed finance. That was before the New York zoning laws of 1916, which mandated that the upper sections of tall buildings be progressively set back to ensure sufficient sunlight at street level and less obstructed views for neighboring buildings. While developers chafed at the restrictions, Kahn welcomed them and made a virtue of necessity. Kahn became a master of the setback style. Some of his works strikingly evoked the indigenously New World stepped temples of the Mayans. Kahn experimented with horizontal ribbon band windows. He chamfered or rounded a building’s corners to enhance a streamline effect. He designed skyscrapers with parallelogram bases or asymmetrical forms. He even attached soaring white fins to the upper sections of towers as a aerodynamic touch. To be sure, Kahn never built a real-life counterpart to Roark’s Enright House, Cord Building, or Wynand Building. But neither did Frank Lloyd Wright. Wright did design a few such structures; and although these inspired Rand, precious little would ever see the light of day — not because they were too daring, but because of their exorbitant price tags, even before one factors in Wright’s notorious cost overruns. The practical Ely Kahn innovated within the limits of the feasible. When Rand completed her manuscript, Kahn proofread it for architectural accuracy. To her gratification he was able to find only one or two very minor details needing correction. Rand then quite appropriately suggested that she preface the book with an acknowledgment of Kahn’s help. But whether out of genuine modesty or out of concern about the controversial nature of the novel, Kahn suggested instead a general tribute to the architectural profession. And so — knowing now the story of the Rand-Kahn connection — we read the dedication of The Fountainhead in a fuller light: We find gratitude to a talented and innovative though not-quite-genius of an architect, a man of integrity and good will who aided a brilliant but still unknown novelist. Dr. Frank Heynick teaches the course “The Fountainhead in New York City,” at New York University’s School of Continuing and Professional Studies. The course begins June 3, 2010. He also authored the related Atlasphere columns "Peter Keating Designed Rockefeller Center?" (2009) and "Roark, Libeskind, and the Freedom Tower" (2005). Thanks for your article. Being an architect, I appreciated the creativity of dealing with zoning laws and other restrictions. Reading the previous letter, I did not find Francon the most interesting character of The Fountainhead. I've been around a number of those "social" types who portray themselves as innovative in some way - but not really. I was far more fascinated by Roark and his view of architecture. The passages describing the spiritual quality of his buildings captured my interest and fueled me for a lifetime. And not just in architecture, I might add. Stories like these help to cement a memory and add humanity and weight to the evolution of a book and an artist. Thank you. I find all of Dr Heynick's architectural links to Ayn Rand not only fascinating but historically informative. I am a native New Yorker, but a Texan for 35 years, and have had questions about Ms Rand's intellectual links to specific architects and buildings since the 1960s. This is a fine article and a significant addition to the information about the novel. I regularly teach "The Fountainhead" in my American Literature classes. This article will be very helpful and add immeasurably to the discussion. My thanks to Frank Heynick. It is interesting that Rand idolized Wright and patterned Roark after him and basically insulted the able and practical Kahn by patterning Francon on him. As an engineer, I've often been struck by the honor accorded to the impractical and expensive "artiste" especially in those areas where cost, functionality, and safety are essential, such as commercial buildings. I've come to believe that Eddie Willers is the most admirable character in Atlas Shrugged. I resigned from Dr. Heynick's NYU Fountainhead course to protest his disregard of Rand's philosophical theme. I spent most of his first class countering the stolen concept and concrete bound approach he was advocating. While I do appreciate Dr. Heynick's historical knowledge of NYC architecture, he's neglecting the broader conceptual context of The Fountainhead for the sake of his subjective, naturalistic, architectural agenda. Rand specifically chose architecture as a metaphor since it's regarded as the barometer of politics in any age. Every single idea, character, chapter, paragraph, sentence, word and punctuation is dedicated to The Fountainhead's philosophical premise. Dissecting it's central theme requires context dropping that goes directly against it's true purpose. Were Rand still alive, she might have been grateful for Dr. Heynick's architectural backstories, but she would be much more concerned with the integrity of her philosophy remaining intact. Rand's philosophy stands on it's own as she intended and in spite of Dr. Heynick's thoughtful architectural contributions and insights.